Thanks to Josh Joyner (Esri) and Dr. Brian Hilton, Salem Alghamdi, Abdullah Alleisa and Mansour Alzahrani (Claremont Graduate University team) for sharing their knowledge and projects on GeoEvent Server. GeoEvent Server tutorials - we ran out of time to mention these, but they could be used as a stepping stone to get familiar with the technology. At Johns Hopkins we've used a couple of them to teach Real Time GIS via GeoEvent Server, which worked well. Each student had their own deployment of ArcGIS Enterprise with GeoEvent Server running in AWS, and started with the "Introduction to GeoEvent Server" tutorial, which contains 6 modules and provides an initial overview of this powerful capability. ArcGIS GeoEvent Server Gallery - lots of other resources for learning/teaching GeoEvent. One of the challenges to working effectively in GIS has been the difficulty of importing certain spatial data formats into a GIS. To meet this challenge, Esri's Data Interoperability Extension has been a longstanding and useful set of tools that enables a wide variety of spatial data formats to be imported for use in a GIS. 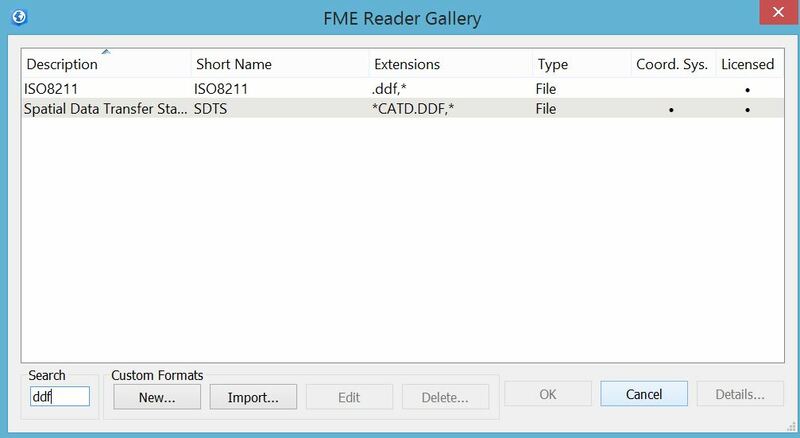 It is an integrated spatial ETL (extract, transform, and load) toolset that runs within the geoprocessing framework using Safe Software's FME technology. 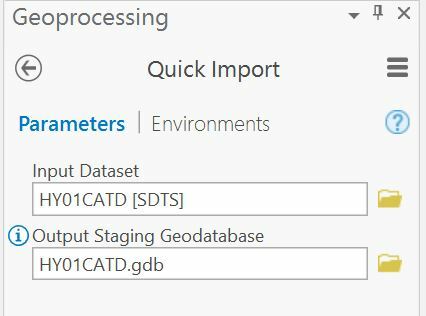 It enables you to integrate data from multiple sources and formats, use that data with geoprocessing tools, and even publish it with ArcGIS Server. I recently tested the Data Interoperability Extension in ArcGIS Pro and was thrilled with the results. Read about how to install and authorize the extension here. The extension does many things, but one that is particularly useful is that the extension creates a toolbox directly in ArcGIS Pro (graphic below). I used this toolbox's Quick Import tool to import a SDTS Format DLG (USGS Digital Line Graph) file directly to a file geodatabase. The tool, like other ArcGIS Pro geoprocessing tools, walked me right through the process: I used Data Interoperability > Quick Import > pointed to my DLG files > named the resulting gdb (file geodatabase). Once imported, I was then able to work with my hydrography, hypsography, roads, boundaries, and other data. DLG files have existed since the early 1990s. Why are we still working with them? The reasons include that (1) they are dated but still useful vector data sets; (2) many geospatial data portals still host data only in this format, such as the USGS Earth Explorer. See below for step-by-step instructions with screen shots. 1. Use Toolboxes > Data Interoperability Tools > Quick Import, as shown above. 2. Using QuickImport pulls up a "specify data source" dialog box, as shown above. 3. 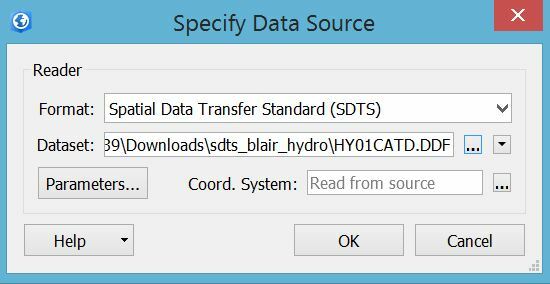 In the specify data source dialog box, use "find other source" and then specify SDTS format. 5. Pointing to the SDTS file (after it has been unzipped and un-TAR'd) and saving it into a geodatabase. 6. Once the file has been imported into a geodatabase, it can be added to a new map in ArcGIS Pro. The data is now ready for use, as shown for this hydrography example, above. ArcGIS Online presentations rock! They present viewers with an interactive set of content, in a linear fashion, all in a single map or scene, with minimal tools. Story Maps have taken the world by storm, but anything beyond the very simplest take significant time and "another app" to build. Presentations, however, are just customized views of a single map or scene, and a total novice with a saved map can build a reasonable presentation in just a few minutes. To build a presentation, one must be logged in (both Organization-based and public logins work) and have a saved map to work with. Let's try an example, using a specific GeoInquiry. Go to http://www.esri.com/geoinquiries and click the "Elementary" icon. Scroll down to "08 - Where does the water go?" and click the lesson icon. Notice that you cannot create a presentation until you own the map. Sign in, and then immediately choose to save the map in your contents. Once signed in and with map saved, "Create Presentation" appears next to your login. Click it. Click the green "+" button to begin creating a slide. From here on, it just takes deciding what you want to show, in what sequence. In the title box near the top, type some text, such as "My Watershed Presentation;" it shows atop the map. Pan & zoom to adjust the map extent as desired, then click the green "SET TO CURRENT" button to lock in the current map extent as the starting point for this slide. Turn layers on/off, and/or change the basemap as desired. Open a popup, and click the checkbox if you want it to open with the slide. You've completed a slide! Now just repeat steps 6-10 as desired. You can shuffle the slide sequence, and edit existing slides. Remember to SAVE your presentation, and hit the PLAY button to test it. It takes some experience to get good at building just the right presentation in the 2D Map Viewer, and the 3D Scene Viewer takes more, but they are very powerful for instruction. Using just a single map, a presentation forces the map creator to think critically about the design of their map, and about the user experience. There's no option for external media to complicate things. This is crucial, focusing the learner on the contents, how they are represented, and what are the most significant lessons … making presentations a nice little performance task for teachers who crave these. Consider having your students build presentations using a GeoInquiry. In a 40-minute period, you could spend 15 minutes going through the lesson, then ask students to spend 15 minutes creating a 3-slide presentation, then have them spend 10 minutes sharing their creation with someone else, before wrapping up. The "tedious and time-consuming part" (creating the map) is already done, so teachers and students can focus on the most critical part -- what does it all mean? -- in the precious few minutes available in class. The number of mapping and analysis tools that are built on web-based GIS tools and data services continues to expand, offering educators exciting and innovative ways to teach core concepts, skills, and spatial thinking. The EPA EnviroAtlas is an excellent example of this. Its goal, according to ASPPH Environmental Health Fellow Jenna Hartley, who creates educational materials using EnviroAtlas, is to develop highly informed local decision-makers by equipping users with data and information to answer many environmental questions. The Atlas can be used in geography, environmental science, hydrology, economics, and other courses, from middle school through high school, and in my view, makes an excellent resource for instructing at the university level as well. According to Hartley, the educational resources have been used with success in multiple university classrooms. I found the atlas to be easy to use. It is based on the ArcGIS platform, so its navigation and list of data layers will be familiar to users of ArcGIS Online and ArcGIS Pro. The EnviroAtlas contains over 100 layers for the USA covering three main themes--ecosystems and biodiversity, people and built spaces, and boundaries and natural features. These layers cover a wide range of topics, from water use to people commuting by bicycle, from protected lands to at-risk species, and much more. Each layer can be toggled on and off. What's more, the working map session can be saved for later use. The "save session widget" saves the EnviroAtlas data layers that you are working with locally to your browser cache. You can even save the session to a file that you can share with others as well. As one of my main concerns in education is to have students be critical of data, including mapped information, I was very pleased to see that the metadata on the EnviroAtlas is plentiful and easy to understand--the sources, scale, date, and other information about each of the map layers. Using the atlas, I was quickly able to make maps, for example, fruit yields in thousands of tons per year, and was fascinated by the patterns, noting my homeland in western Colorado stood out with its magnificent orchard lands (below). A few of the layers I was curious to explore were not available during my last session with the atlas, and I was surprised and impressed to see a message indicating that an email was being automatically sent to the EnviroAtlas administrators about those very layers I was trying to access. That's a great service that I wish more web mapping apps had! Thanks to educator Jenna Hartley, a multitude of educational materials can also be used to teach with the EnviroAtlas. In these lessons, students engage in highly interactive hands-on learning where they are introduced to data visualization and can build their analytical, geospatial and decision-making skills. The lessons can also be recreated for classrooms without access to computers or the internet. Concepts the lessons address include ecosystem services, watershed geography and management, the water cycle, air quality, urban planning, biodiversity, and decision-making. All lesson plans include an outdoor portion and align with both the NGSS (Next Generation Science Standards) and individual state Science Standards. One of the most exciting things about many of today's web mapping applications, including the EnviroAtlas, is that the data layers can be used inside ArcGIS Online and even inside ArcGIS Pro. This greatly expands the utility of the EnviroAtlas to the ArcGIS Online environment where spatial analysis tools such as routing and overlay can be performed on the data. To do this in ArcGIS Online, select one of the layers, go to the layer list, and "access web service." Copy the URL, go to ArcGIS Online, modify the map, Add data from Web, and paste the layer there. I did this for workers who bike or walk to work, focusing on the walk and bike-friendly community of Portland, Oregon, below. This is really quite exciting and has enormous implications, because the hundreds of layers from the EPA EnviroAtlas can be used inside a GIS environment for further analysis! For a list of all of the data available in this manner with their REST endpoints, access this URL: https://enviroatlas.epa.gov/arcgis/rest/. One of the EnviroAtlas layers--percent of workers who bike or walk to work--shown in ArcGIS Online. For more information about how to use the Atlas, see these tutorials and videos.